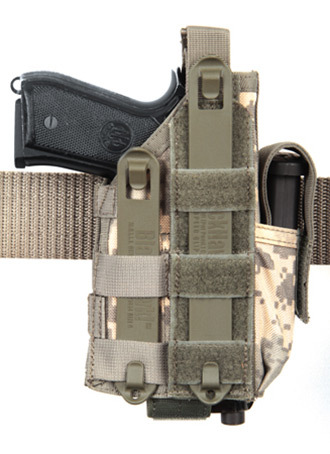 BlackHawk® Omega® VI Ultra universal modular light holster with light. Also includes Drop Leg Extender. The Omega® VI ultra is an ambidextrous universal modular light holster. It is designed for select pistols with light mounts. It is configurable for wither right-side wear or left-side wear and is MOLLE/S.T.R.I.K.E.™ compatible. It can also be used without the light mounted. The bottom of the holster is sewn closed to prevent accidental discharge of your light. Adjustable belt hanger with DLE and quick release. High or low ride, removable strap. Two adjustable and removable non-slip leg straps.